A Garrison colonial house sits on a half of an acre property in a quiet neighborhood at 59 Rural Drive. 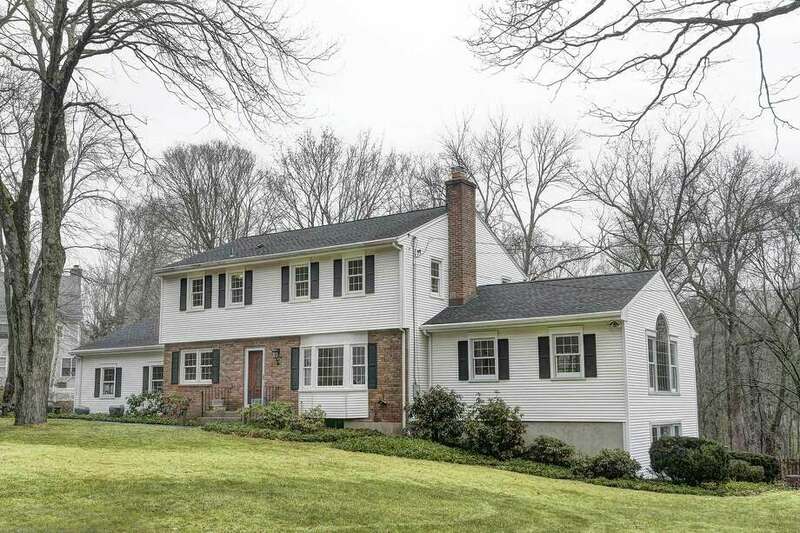 NEW CANAAN — A Garrison colonial house sits in a quiet neighborhood at 59 Rural Drive. Although the street is not a cul-de-sac it is not well traveled and therefore provides a place where residents can walk their dogs and children can ride their bikes. This location also allows residents to walk into town and to the train station. A largely level front lawn serves as a welcome mat to the half an acre property and to the white vinyl-sided and brick house with black shutters. The driveway is lined in Belgium block and leads to the attached two-car garage. A slate path leads to the entrance of this 4,160-square-foot center hall colonial, which was built in 1961. Two columns stand at the wide entrance from the foyer into the formal living room, where there is a bay window and a red brick fireplace on a wall of floor-to-ceiling bookshelves. The living room opens to the breakfast room. On the opposite side of the foyer is the formal dining room. The updated, eat-in country kitchen can be accessed from the dining room. It features a center island topped with granite, granite perimeter counters, and stainless appliances. The ceramic tile flooring is arranged on the bias and has a double border of darker tile. One part of the counter serves as a peninsula, partially separating the kitchen from the sizable breakfast room. The peninsular counter also creates a breakfast bar with room for two stools. The family room adjoins the breakfast room and, as in the foyer to the living room, there are two columns between these two spaces. The family room has a vaulted ceiling, a Palladium window with a six-over-six double-hung window on either side, and a wall with two areas of floor-to-ceiling bookshelves. On the second floor there are four bedrooms; the master is the only one that is en suite. The others share a full bath in the hallway. The finished walk-out lower level has a recreation room, a full bath and a large laundry room. In the recreation room there is wall-to-wall carpeting, paneled walls, recessed lighting, a ceiling fan, and L-shaped built-in bookshelves on two walls including granite counters and lower cabinets. It also has a door to the patio and backyard. The second room is not immediately accessible. It requires exiting the door from the recreation room and entering a separate door into this large room filled with natural light. Because of this separate entrance this room could be used as a home office or art studio. There is the possibility of constructing an interior door to provide interior access from one room to the other. In that case this space could also be made into an in-law or au pair suite, or a children’s craft or playroom. This office has a hardwood floor, a wall of floor-to-ceiling bookshelves, a built-in desk area, and drawers and cabinets. Because of the configuration of a neighboring property the backyard of this house seems larger than it actually is. The listing agent describes this property as “very pretty and private, with manicured grounds and a calming, Zen-like feel.” It has raised flower and vegetable gardens and a concrete patio, sea grasses, a natural wood picket fence, and a red garden structure that’s not meant to have any function. It is simply a meditative, soothing part of the Zen-like yard. For more information or to make an appointment to see the house contact Carol Pelzner of Halstead Properties at 203-858-0931 or cpelzner@halstead.com.